Will removing Home Rule hurt the City? As far as has been able to be determined, using information from the City Finance Director, the only taxes currently in effect that we may lose (and can’t be converted to non-home rule) are the gasoline tax (projected to be around $850,000 in 2018) and the natural gas tax for non-Nicor users (exact number unknown, perhaps $100,000-$150,000). That’s less than $1 million out of a $137 million budget (<1%). Given the amounts of money the City has spent and intends to spend on the Shodeen 1 N. Washington apartments project (over $4 million so far in property purchases, cost of demolition, temporary parking lot construction, and other parking garage giveaways, and the $16 million GO bonds due yet to be issued for Shodeen), the gas tax money can surely be made up somewhere, or unnecessary spending cut. And citizens can always vote themselves a property tax increase by referendum if they think it is necessary and the City has been using the funds entrusted to them responsibly. But why do I hear people saying the City will lose $3.3M-$5.2M/year without home rule? Those numbers are based on the assumption that the City will lose all of our home rule taxes and not make any effort to reinstate them by referendum or convert them to non-home rule taxes. 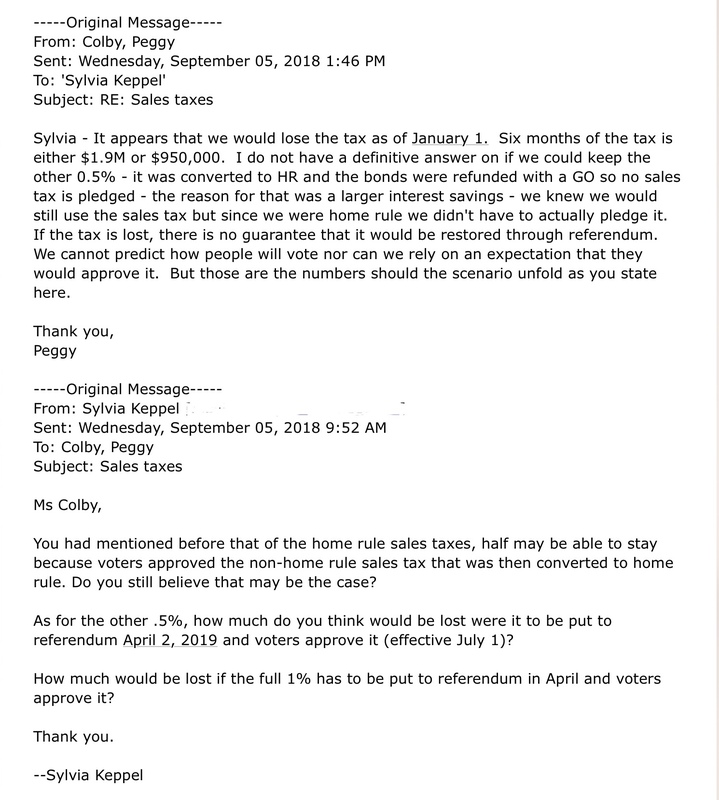 The Mid-Year Finance Report on p. 15 says, “…$3.3M – $5.2M Annual Loss • Would be able to put referendum for NHR Sales Tax on future ballot”, but that last part very often gets ignored. If the City were to lose half (.5% instituted under home rule) or the whole (+.5% that had been approved by voters while non-home rule, but converted to home rule; total = 1%) of our home rule sales tax, and the sales tax were to be put to referendum April 2, 2019, with voter approval it would go into effect July 1. Based on that scenario, the Finance Director has replied in an email that the 6-month loss of revenue would be $950,000-$1.9 million (.5% or 1% sales tax). That represents a one-time loss if citizens decide they want to reinstate the sales tax. If the City can convince the people the money is needed, voters will vote for it, as they did for that first .5%. But with home rule right now, the City Council can increase sales and other taxes all they want, and citizens have no choice, no vote. Won’t it raise my property taxes? Getting rid of home rule will actually cap property tax increases. Right now there is no limit to increases. Were home rule to be removed, the City’s property tax levy could increase no greater than the cost of inflation (CPI–Consumer Price Index) or 5%, whichever is less (new construction and bond debt do not fall under the cap). To raise the property taxes beyond the cap, the City would have to seek approval of the people via referendum. Will it put more burden on residents and take away taxing opportunities for non-residents? Without home rule, the sales taxes can stay at current levels of 1% (a likely scenario is half may have to be reinstated by referendum, though whether any or all of the 1% will require a referendum is uncertain at this point), but sales taxes can’t be increased past that in non-Home rule municipalities. Remember that sales taxes hit not just non-residents, but residents as well. It would be a different story if Batavia had a big mall like the Chicago Premium Outlets Mall in Aurora that would draw people from miles around and that we could take advantage of tax-wise, but Randall Rd and downtown Batavia have a more limited outside draw. If you live in Batavia and shop in Batavia, you pay Batavia sales taxes. You also pay sales taxes wherever you shop. For all we know, the money you spend outside Batavia may be just balanced by the outside shoppers who occasionally shop in Batavia while doing most of their shopping elsewhere, resulting in an even trade, with no more tax benefit than had each person been required to only shop in his/her own town. Furthermore, most of the tax and fee increases over the last couple of years, while under home rule, have been exclusively to residents (e.g., water, sewer, leaf and brush pickup, electricity, property tax). But hasn’t the City been acting responsibly? By the City’s own admission, they have increased property taxes beyond what they would have been able to without home rule, even if only by a small amount. Proponents of home rule argue that small amount is proof the City Council won’t abuse home rule taxing powers, but where is the purported benefit that home rule will decrease property taxes by shifting the burden to non-residents? We should have seen less property taxes, not more than the non-home rule capped amount. Besides property taxes, they have increased or created numerous taxes and fees. Their budget continues to increase, especially in the last 2 years. Since 2013, when many on the City Council were replaced, there have been some positive changes, and there have been some negatives. Consultants have been hired for projects that have been unnecessary (e.g., rebranding ideas, numerous studies connected to the downtown apartments project, and the Prairie State electricity contract legal review—$280,000 for just that one, with the result being, in effect, “we can’t help you”). When it comes to the massive Shodeen 194-unit apartments project scheduled for downtown, the Council has stopped listening to citizens’ concerns and has spent money like water, over $4 million so far. They’re selling Shodeen 3/4 of a downtown block for $10 and planning to issue $16 million in bonds on top of that. They’re spending money they don’t have, debating which funds to raid in order to loan money to the TIF Districts that are millions of dollars in debt–the TIFs that already take property taxes from the other taxing bodies (schools, parks, library, etc.) and turn the money inward to benefit a few. And it’s not just about what they’ve done, but what they might do. Because there are few limits to taxing and bonding power for the City Council under home rule, anything is possible. Chicago’s soda tax was an example of a home rule tax. A very real possibility for Batavia is a Stormwater Utility, a.k.a., a “Rain Tax”, that would tax all properties for impermeable surface areas (e.g., building footprint, driveway, parking lots) and because it is technically a “fee”, not a “tax”, churches and other non-profits would not be exempt. When asked if Holy Cross would be exempt because of all its retention area, the answer was, “No.” A Stormwater Utility has resurfaced numerous times, most recently on Aug. 28, 2018 when 3 aldermen strongly advocated implementing a Stormwater Utility (the others remained silent). Another expense currently agreed to but not exercised yet is the issuance of $16 million in General Obligation bonds for the Shodeen apartments project. When you have unlimited resources at your disposal in terms of new taxes and unlimited borrowing that home rule gives you, where’s the incentive to save and prioritize and to say no to the many shiny baubles clamoring for your attention? And there are many projects out there that the City Council has identified in their strategic planning that would amount to $60 million – $75 million more in spending above and beyond what is necessary to maintain what they have. Those projects would require additional revenue, as was explained in the August 28, 2018 Public Works Mid-Year Report presented to the City Council Committee of the Whole meeting (summarized in “Bridge? Dam removal? Parking? Public works chief asks Batavia council for more direction”, Susan Sarkauskas, Daily Herald, 8/31/18). With home rule in place, the City Council can increase taxes and issue bonds without asking the people via referendum what they think is important or how much of a tax increase they are willing to take on for projects. Those bonds would have a higher interest rate, something that Shodeen may not be willing to pay if his budget is as tight as he said it was when he successfully petitioned the Council to eliminate the retail space on Wilson in favor of all apartments for cost savings. can the City even get TIF bonds for these apartments? Who would buy those bonds? What about the City’s “Crime Free Housing” (“CFH”) ordinance that applies to rental properties with 6 or more units? Hasn’t that made Batavia safer? No evidence has been put forth to verify this claim. Crime had been dropping in Batavia as well as Kane County, in single family homes as well as apartments, before the ordinance went into effect in 2012, and continues to drop. From an article in the Kane County Chronicle, police service calls to Batavia Apartments had dropped from 764 calls in 2008 to 466 calls in 2011, but went up in 2012, the first year the ordinance was in effect, to 587. So using these numbers, can we say “Crime Free Housing” increases crime? No, as the article states, all police calls are not crime-related, so the statistics on police service calls do not correlate directly to crime rate, nor can drop in service calls or crime be directly connected to the “CFH” ordinance. Batavia has always been considered a safe community to live in, and the police are to be congratulated for their efforts. To prove the “CFH” ordinance has been effective, one would need to show the number of evictions as a result of the ordinance that could not have happened otherwise, and no one has offered those numbers. Without home rule, there are nuisance laws that can be employed to address crime in rental housing. Indirectly, Home Rule affects the schools in that if the City raises taxes and creates new taxes and fees without restraint or voter approval, and residents feel squeezed by the overall tax burden, they will be less likely to approve referenda put on the ballot by the School District or any other taxing body.